One Scotsman perhaps put it best when he doodled this poem during a sermon as he sat in the midst of his church members: “To dwell above with saints in love, Aye, that will be glory! To dwell below with saints I know, Now that’s a different story.” Some of us have read a few chapters of that “different story” throughout our life in the church. And if you haven’t yet, I can assure you that you will at some point if you are a part of a local church. The kind of true community envisioned in the Bible is something that we all long for and yet it often seems beyond our reach. And even when we reach it and get a taste of it, it’s hard to retain that experience. And so, some today have rejected the idea of the local church altogether. There are many professing Christians today who think the local church is irrelevant to their Christian witness, their Christian discipleship, and their personal relationship with God. First, think about how community functions in relation to our witness in the world. One of the most powerful things to the world is a community of diverse people getting along, loving each other, forgiving each other, being patient with each other, and persevering together through thick and thin. Just think of how many broken and divided communities there are in the world. There are broken marriages, broken families, church divisions, nations warring against each other, institutions breaking up, and the list could go on and on. The world is filled with broken and divided communities because of how sin affects all of our relationships. How beautiful it must be then for the world to see a congregation of Christian believers made up of all kinds of quirky and sinful people loving each another and persevering with each other through all kinds of trials and conflicts. Indeed, as the psalmist writes: Psa. 133:1 Behold, how good and pleasant it is when brothers dwell in unity! As Tim Keller notes in his book Center Church, Christianity can produce some exceptional individuals that the world will notice and respect. But so can Atheism and many different religions. And people can just conclude that they are exceptions to the rule. But one thing that other religions cannot produce is the kind of loving community that the gospel produces. Is this not what Jesus taught when he prayed: “John 17:20 “I do not ask for these only, but also for those who will believe in me through their word, 21 that they may all be one, just as you, Father, are in me, and I in you, that they also may be in us, so that the world may believe that you have sent me. 22 The glory that you have given me I have given to them, that they may be one even as we are one, 23 I in them and you in me, that they may become perfectly one, so that the world may know that you sent me and loved them even as you loved me. Jesus taught in John 15-17 that one of the main ways that people will know that we are his disciples and that God the Father sent Him and loves Him and us, is in the quality of our love for each other as a community of God’s children who have His Spirit of love. And so, you see, a self-sacrificial, loving community, where we treat each other as brothers and sisters, bear with one another, forgive one another, rejoice with one another and suffer with one another, and persevere patiently with each other is one of the most powerful things when it comes to our witness. If you want to see your family, friends, and neighbors saved, don’t simply pray for them and share the gospel with them. Those things are absolutely essential and may be enough for them to come to saving faith. But often more is needed. They need to see that the gospel can produce a community of love that is radically different from what they see in the world. And if they see it they will want to know more about the gospel. And our witness to them about Christ will be more credible and compelling. And so, in addition to prayer and sharing the gospel with your lost loved ones you need to become deeply involved in the community of a local church and be “eager to maintain the unity of the Spirit in the bond of peace” if you want to have a powerful witness to them (Eph. 4:3). No doubt we should never confuse community with the gospel or say that the quality of our community is what makes the gospel true or not. But the quality of our community will attract people’s attention and make them eager to hear the gospel and embrace it by faith. Not only does community function as a powerful witness to our unbelieving family members, friends, and neighbors, community also functions in a vital way in relation to our character. Think about how Jesus not only taught about godly character but that he gathered around himself a community of disciples and modeled godly character for them as the Son of God in the flesh. Not only were they informed intellectually of what godly character should look like through His teaching, he demonstrated it for them in His actions toward God, them and others. And this is simply the principle that we all know well, namely that we learn best from example. And so, community is vital for shaping godly character in our lives in this way. We need to hear the call to Christ-likeness in God’s Word but we also need each other to model godly, Christ-like character. As Paul put it, “Be imitators of me, as I am of Christ” (1 Cor. 11:1). Community also provides the opportunity for godly living. We simply cannot grow in godliness apart from the Christian community. The “one another’s” of the Bible cannot be lived out if we are lone ranger Christians. Take one passage for example, Rom. 12:9 Let love be genuine. Abhor what is evil; hold fast to what is good. 10 Love one another with brotherly affection. Outdo one another in showing honor. 11 Do not be slothful in zeal, be fervent in spirit, serve the Lord. 12 Rejoice in hope, be patient in tribulation, be constant in prayer. 13 Contribute to the needs of the saints and seek to show hospitality. 14 Bless those who persecute you; bless and do not curse them. 15 Rejoice with those who rejoice, weep with those who weep. 16 Live in harmony with one another. Do not be haughty, but associate with the lowly. Never be wise in your own sight. 17 Repay no one evil for evil, but give thought to do what is honorable in the sight of all. 18 If possible, so far as it depends on you, live peaceably with all. The primary context in which these commands are to be lived out is in the context of a local church, as Paul was writing to the Christian churches in Rome (Rom. 1:7). And plenty of other “one another” passages that were written to local churches could be mentioned here. The point is that you cannot grow in Christ-like character, in accordance with God’s Word, apart from being deeply involved in the community of a local church. This is why it’s completely backwards when someone says that they admire a person’s faith and Christian character when that person has little to no involvement in a church. This is why Christians are deceiving themselves when they think that when it comes to Christian discipleship and growth in Christ-likeness it’s no big deal to join a church and get deeply involved with it. The call to love one another and all the other “one anothers” of the Bible are to be lived out in the context of a local church community. And if you are considering leaving your local church because you have been offended in some way, consider whether or not you are leaving right at the time when God is calling you to grow in patience, forgiveness, prayer for your enemies, humility, and love. How can you grow in those things apart from conflict? Conflict is inevitable, and it’s not fun, but it’s also an opportunity to grow in Christ-like love and prayer. It also often reveals our own sin and weaknesses and makes us more humble and dependent on God. Life is not easy to navigate in general and it’s also not always easy to know how to apply God’s Word in such a complicated world full of complex relationships and circumstances. But there is wisdom in a multitude of counselors. There is also wisdom in those who have been Christians for many years and have been through all kinds of scenarios that challenge their faith and yet they keep on persevering by God’s grace. There are also many Biblical principles that take wisdom to know how to apply in our day and age. Some are quite clear, like the command, “don’t commit adultery.” But others are not as clear, such as honor one another (Rom. 12:10), restore those who have fallen into sin in a spirit of gentleness (Gal. 6:1), show hospitality to strangers (Rom. 12:13; Heb. 13:2; 1Pet. 4:9), and don’t be greedy (1 Cor. 5:10; Eph. 4:19). What does it look like to honor one another in our time and place? What does gentleness look like for this particular person? What is good hospitality in our culture? What does greed look like. . .how much is too much spending on myself? We all have blind spots and we all struggle with applying these Biblical principles in specific ways in our day and age. But there is wisdom in how to apply God’s Word in the community that a local church provides. We could also add that the local church provides us with the necessary accountability that we need as Christians. It’s incredibly hard to live according to God’s Word as individuals apart from the wisdom and accountability that the community of a local church provides for us. Apart from the accountability of brothers and sisters we are even more easily “prone to wander Lord I feel it, prone to leave the God I love” as the hymn writer once put it. Apart from the accountability of a local church we more easily succumb to the temptations of the world, the flesh and the devil. Keller notes, “Lewis’ point is that even a human being is too rich and multifaceted a being to be fully known one-on-one. You think you know someone, but you alone can’t bring out all that is in a person. You need to see the person with others. And if this is true with another human being, how much more so with the Lord? You can’t really know Jesus by yourself” (Center Church, p. 314). This rings true in my experience. I know Jesus better as a Christian because I have seen how his grace has been sufficient for others in my church. I have seen how others feed on His Word by faith and cling to Him in all kinds of trials. And that teaches me something that I wouldn’t have learned about Jesus by myself. And so, we need the community of a local church in order to know our Triune God better. And so, you see, the Christian community is vital for the strengthening of our assurance of God’s promises. As a pastor, I get the privilege every week of assuring God’s people of God’s love for them in Christ through the preaching of God’s Word and the administration of the sacraments. And I can see it on their faces. I can see how powerful it is for them to have someone outside of themselves, who represents Christ to them, assuring them of God’s love. But it doesn’t have to end in the pulpit. Christians in a local church should also be encouraging one another in Christ of God’s love for his people on a regular basis. The promises of the Gospel are meant to be gossiped widely. They are meant to be publicly proclaimed to others in the context of a community. And we all need them to be spoken to us from outside of our uncertain self (even pastors need this). Our assurance of God’s love grows in this way in the community of a local church. And so, do you see the wisdom of why God has called us to dwell together as a community of believers? Do see why his Word exhorts us not to neglect to meet together? Do you see why we need to gather together for worship, times of prayer, small group studies, hospitality in each others homes, serving alongside each other, and in other ways of practicing the communion of the saints? God’s good design for you as a Christian is to become deeply involved in the life of a local church. And so, my prayer is that if you are reading this as a professing Christian and you don’t belong to a local church that faithfully preaches the gospel, administers the sacraments, and practices church discipline, that you will join a church like this and get deeply involved. 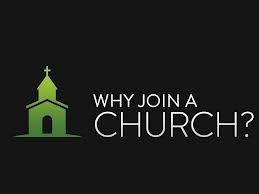 And if you are already a part of a local church perhaps this will help you come to a better appreciation for why God has called you to be a part of a local church. And perhaps it will encourage you not to give up on your church but to press on in faith, hope and love with your brothers and sisters in Christ. And may God be glorified greatly in our midst as he saves others and sanctifies His people more and more until Christ comes again and we all dwell together in perfect unity and love! This entry was posted in church, church membership, communion of saints, community, local church, visible church and tagged church, church membership, communion of saints, community, local church, visible church by Brian Cochran. Bookmark the permalink. Thanks for writing this! I could never quite get my thoughts this clear. Thanks! This is a really good synopsis, I’d say, of why everyone needs to be part of a church. As Men, we tend to isolate ourselves, but we need to pursue other men (properly, let’s not get crazy here) who will help sharpen us in Christ and draw us closer to Him. This is a well said article!